Four astronauts face their own paranoia when a meteor shower unleashes deadly spores and traps them inside a moonbase. Moonbase ARK, Mineral Exploration Camp: Day 187 of a one-year mission – An unexpected meteor shower critically damages the base. Communications systems and one of the two escape pods are destroyed. Colonel Gerard Brauchman attempts to transmit an evacuation request to Madsen at Mission Control. With the carbon monoxide filtration system now leaking poison throughout the station, Ava Cameron risks her life on a mission to seal the airlock. Ava succeeds and returns to base with one of the meteorites. Doctor Lance Krauss realizes that carbon monoxide is still leaking into the station. He warns the other three crewmembers to stay vigilant and to watch each other for signs of nausea or hallucinations. Lance and Ava examine spore samples found inside the meteor rock. Ava cuts her finger while examining a sample, but says nothing. Lance learns that the spores reproduce without needing any elemental exposure, only light. Ava starts feeling nauseous and leaves the lab only to collapse in the hallway. She wakes up in the medical bay to find that she is inexplicably six months pregnant. Lance and fourth crewmember Bruce Johns want to treat her contagion, but Gerard insists on a quarantine lockdown. Ava dreams that she gives birth to a strange baby. Bruce and Lance speculate that the spores have infected Ava. Ava later screams as she gives birth. The three men rush into the medical bay. Ava is no longer pregnant. Spores are seen on the ground in a blood pool. Bruce returns to his quarters and consoles himself with alcohol. Ava wakes again and sees a baby with a gaping mouth feeding on her breast. She flails violently around the room while the baby hides. The three men rush to her aid again. In the commotion, Bruce claims that something bit him, but Lance assumes it is a carbon monoxide induced hallucination. While Lance examines Bruce’s newly acquired infection, Bruce speculates that the spore used Ava to reproduce itself. Later, the baby is seen having transformed into a fully formed replica of Bruce. The creature then begins trying to emulate Bruce. After reviewing surveillance footage from the lab, Gerard examines the cut on Ava’s finger. While they argue, Ava sees the creature. Gerard assumes it is a contagion-induced hallucination. As he prepares to lock the door and isolate her, the creature knocks Gerard down from behind. While Lance attends to Gerard in another room, Bruce frees Ava. Bruce then returns to his quarters. Gerard returns to Ava and finds that she has been set free. She attacks Gerard with a scalpel, but he is able to inject her with a sedative. Gerard assumes that Bruce set Ava free. Gerard tells Lance that Ava was infected through her finger. Meanwhile, the creature kills Bruce and takes his place. Lance discovers Bruce’s body along with a recording that Bruce made about the creature. Elsewhere, the creature tries to kill Gerard. Lance tells Gerard that the thing he thought was Bruce is actually the creature from Ava’s stomach. The two men collect Ava to work on a survival plan. The creature is able to trick Lance into the airlock where Lance is subsequently torn apart by the pressure. Ava realizes that the creature can sense their actions through her mind. She and Gerard look for a clue in Bruce’s quarters. They watch a recording of Bruce that suggests escaping in the remaining escape pod. Gerard and Ava sacrifice all of the remaining station power into kickstarting the escape pod preparation. Once the launch sequence is initiated, the creature attacks both astronauts and uses the escape pod himself. With only minutes of oxygen remaining, a rescue shuttle arrives. Gerard and Ava decide to hold their breath and make a run for the shuttle. Back on Earth, Madsen and his team discover the crashed escape pod, but do not find anything inside. When the rescue shuttle is able to communicate, Gerard delivers a frantic message to kill whatever emerged from the pod. The creature is then seen hiding in a structure near the crash site as it morphs into a humanoid with a gaping maw. To have any chance of being immersed in a low budget sci-fi fantasy, there has to be an understanding that the movie is not going to look like Ridley Scott made it. It cannot look like 1960’s-era “Star Trek” either, but it can still cheat the production value as long as the budget is not a distraction. Even “Star Wars” got away with using a video production switcher as the Death Star’s command console. And TV series “Babylon 5” was inventive, intelligent, and influential, in spite of its supposedly five mile long space station looking like it was confined to a studio apartment. Independent science fiction films can start in the hole by biting off more than they can chew in the scenery department. With one or two zeros missing from the production account, it is a wonder why some even try filming ambitious outer space concepts without having the resources to be remotely convincing. “Stranded” appears aware of such limitations. It looks at least as good as a space-set episode of “The New Outer Limits,” and that is all it needs to be to push its atmosphere off the ground. It is not going to compete with “Prometheus” on this level anyway, nor does it have to. The performances are also “good enough,” which may sound like a slight against the actors, but really it is a reflection on the script. Because while “Stranded” may be passable in production design and casting, a greater concern for the film is its lack of a gripping story or sensible character behavior. When a meteor shower critically damages a base on the moon, the four astronauts in the facility scramble to repair the air filtration system. Once the oxygen resumes a free flow, the crew finds a new problem in the form of a strange space spore that is brought back onboard in a meteorite sample. As paranoia and sickness set in, the crewmembers are left to figure out if they are suffering from carbon monoxide poisoning, or if they have been infected by the spores. Either way, everyone’s judgment is severely impaired. Though that is a finger that can be pointed at the script, and not at the spore. With dangerous levels of carbon monoxide entering the air filtration system, the station’s doctor makes a point to warn the other three crewmembers not once, but twice, that they must vigilantly monitor each other for symptoms of CO poisoning. Doc mentions that those symptoms include disorientation and headaches, among other things. His second warning specifically ends with, “if any one of you starts feeling confused or abnormal … you come see me immediately.” Just four minutes of screen time later, crewmember Ava suddenly becomes nauseous and asks to lie down. Even knowing that she had just been handling an unknown space spore that behaves like a bacterium mere moments earlier, the doctor then simply watches her walk right out of the research lab. Wait. What was that about vigilantly looking for symptoms? Rivaling the doctor in actions that grossly violate his own advice is Christian Slater’s Colonel Gerard Brauchman. With Ava looking like death warmed over and now inexplicably six months pregnant after handling the spore, Brauchman has the idea to lock Ava down in quarantine. The colonel either does not know what the word quarantine means, or it has an entirely different definition on the moon. After Col. Brauchman locks down the medical bay room to “isolate” Ava and the probable contagion, the door is unlocked no less than four times. On the second breach, the colonel specifically commands, “don’t touch her.” Each of the other two men does anyway. Following the third entry into her room, Brauchman exclaims, “I’m locking this room down.” The fourth time he closes with, “you’re suffering from contagion, I’m going to have to put you in an isolation cell.” In total, each male crewmember had already touched her at least three separate times since the “quarantine.” Whatever infection she may have, every dust mite on the station would have contracted it by this point. And let’s not forget the troublemaker who started this mess in the first place. Crewmember Ava brings a space rock onboard the station that contains an unidentified living spore. When she cuts herself while examining the sample, she deliberately hides that fact from the doctor standing next to her. Forget about the negligent breach of research lab protocol. Would you not want the doctor to treat you immediately if you had just pricked yourself with an unknown organism from outer space? I can accept that these crewmembers are not amongst Earth’s most elite military and scientific minds. That is probably why the four of them were shipped off to the moon for a yearlong mission of nothing more important than mineral collecting. Harder to swallow are the consistently boneheaded choices everyone makes simply so that there can be a story. Without dimwitted decisions giving everyone something to do, “Stranded” would stand out even more as a poor man’s “Alien” clone. Although the creature here takes the form of a human, so there is not even a decent monster on hand to liven things up. Had the personalities been able to carry believable suspense, they surely would have been crushed under the paint-by-numbers tale of flashlight hallway searches for a monster on the loose. 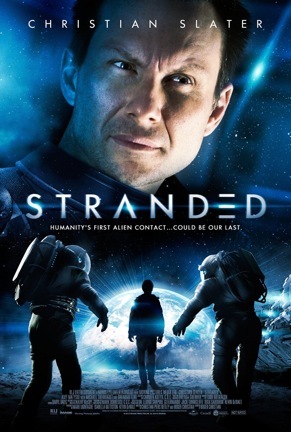 Production wise, “Stranded” started off in a better position than most independent sci-fi. But its dull story just cannot spark any interest, much less sustain it. August 28, 2013 by Ian Sedensky.